This is such an amazing giveaway, congrats to you! Because I LOVED The Young Elites and I just really really want to read this one! The Young Elites was absolutely amazing and can't wait to get my hands on The Rose Society. First of all the cover... I mean SWOON! and second I absolutely LOVED The Young Elites and I need to see what happens next!! Ooh this looks really good! I loved the Legend series by her. I love Marie Lu!! thanks for doing this great giveaway!! Thank you so much for the giveaway!!! Ever since I read the young elites, I have been dying for the second book. The Young Elites was one of my favorite and to read books of 2014. I am DYING to read this one. Thanks for the giveaway! I met her at RT2015 and she was amazing- would so love to have this book! Thanks for the chance! You're so lucky to have gotten this! I don't know why you'd want to give it anyway but thanks for the chance to win it! I've been dying to know what happens after The Young Elites. The cover is beautiful. Thank you for this giveaway ! The Young Elites was one of my favorite reads this year and I;m so excited for this one! I love The legend series and the young elites! I've always wanted to get my books signed by Marie Lu, but I live in the UK and she doesn't often visit. I have always indulged in Marie Lu's writing, from Legend to the Young Elites. I especially admire her character building - the way she introduces us to such interesting characters that add so much to the story, from villains to heroes. As someone who enjoys writing herself, Marie's books have (and continue to) help me improve upon my own characters and stories. I can't wait to read the Rose Society (and I hope the copy I read is a certain signed ARC... *hint hint*:) Thanks for doing this giveaway! I really enjoyed reading the young elites so i really want to readt he rose society. Marie Lu is possibly on of the best writers I've come across. She makes her stories vividly detailed and just has a way of knowing the perfect scenarios to get us hooked. In addition, her characters are amazing and it seems she could write just about anything. Heck! If she wrote an instruction manual, I'd read it. I want a copy of this ARC so so so so bad I can't even fully express it with just a few words. The most obvious reason of course, is because I read The Young Elites and thought it was brilliant. Adelina is a character who has really managed to capture me in a way that many others have not. I LOVE this story. I love the characters, I love how I can relate so well with the little bits and piece of them but that I am able to take a step back and disagree with them too. None of them come off as cookie-cutter to me and that is especially in Adelina's case. That alone is so refreshing!! I genuinely cannot wait to see what's in store for her and Violetta and what's to come of Raffaele and... Enzo?????? WHICH is why this opportunity is so exciting to me because I'm quite literally on the edge of my seat waiting to read anything I can get my hands on with respect to The Rose Society. Major kudos to Marie Lu for creating this gem of a universe. I'd be so happy to win this giveaway but even if I don't I'm definitely begging my uncle for the money to get my copy come October. Thank you so much!!!!! Yay Rose Society! Thanks for doing the giveaway! Super generous. THIS IS MY MOST ANTICIPATED RELEASE OF 2015!!! I NEED! I loved the Young Elites and am a huge fan of Marie's books! I love this fantasy world and characters so much, and what she is doing with this series. This was one of my most anticipated 2015 releases too :) Thank you so much for doing this giveaway! Marie Lu is my biggest writing inspiration, and I have/love all her books and I love her writing style! She's even inspired me to write my own book which I just reached 40,000 words on! I love Marie Lu's work, and I really want to read the next book in this series to find out what happens to Adelina. Does she become crazy? Does she try to resurrect her dead beloved? I absolutely loved The Young Elites, even though I had originally put off reading it. I really like how we don't quite know if Adelina is good or bad at the end of the book.... (I must know!) Also that resurectionist girl better bring Enzo back. I absolutely love the Young Elites and I love Marie Lu and all her books! Also Grisha for life! Anyways I'd love it if you'd picked me to win the ARC, I'd be in Seventh Heaven I literally died when I found out Marie was giving out ARC's and I wouldn't be there. So thanks for giving us all this chance!!? The Young Elites was my favorite fantasy (or possibly dystopia?) I read last year! 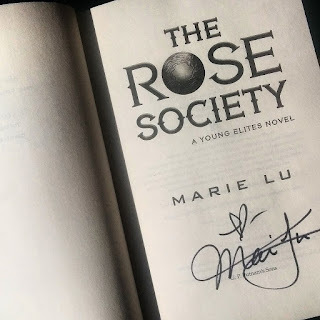 I was lucky enough to have a wonderful friend that got my copy of The Young Elites signed by her, and I am dying with excitement for The Rose Society! Thanks for the giveaway. I've been dying to read the Young Elite books, and I'd love an ARC of The Rose Society. I love finding new books to love!! Marie Lu creates such beautiful stories, and I can't wait to see what she has in store! I love Marie Lu and I haven't read an ARC before. It all sounds really exciting! I want the Rose Society because the Young Elites is one of my favorite books and I can not wait for it any longer! The Young Elites was one of my favorite books of 2014. I CANNOT wait to get my hands on TRS! Thank you so much for the opportunity! Oh my God, really loved Young Elites! Can't wait for what Rose Society has in store for Adelina. Marie Lu sure knows how to play with emotions. Besides, ARC! Might be my only chance to get one so fingers crossed I win!!! I'd like to read The Rose Society because Marie Lu is a wonderful writer and I'd like to read all her work for the rest of my life. This is a great giveaway. I'm so excited to see how Adelina's story unfolds, and I hope that her ascent into anti-heroness/villainy goes spectacularly. It's so exciting you got a SIGNED COPY!! omg. I absolutely adored tge first book in this series and I'm kinda scared but most excited to see where Lu takes it, bc the ending to the first books was wicked. I've been a fan of Marie Lu's writing ever since I first got my hands on her Legend trilogy. When she decided to dip her toes into the world of fantasy, I was ecstatic! 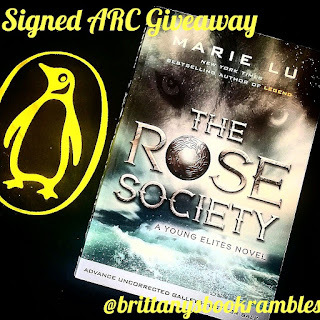 I'm so grateful you are hosting this giveaway, even a chance to receive an arc of the Rose Society is amazing! I would love to win this giveaway because I loved the Young Elites! Thank you so much for hosting this giveaway. You are soo generous! Ugh, I want this SO bad. Marie Lu is one of my favorite authors and I can't wait to see where she goes with this series. I bought The Young Elites the first week it was out, though I hadn't realized how new it was. All I thought was "oh my GOD Marie Lu's new book!!" because I knew anything by the author of the Legend series would be fantastic. Fast forward three hours later, me clutching the book with a facial expression like D: both because of the end, and because TRS didn't even have a name yet, it was so far off :((( now that it's getting closer I'm waiting in extreme anticipation (and a little bit of fear, spare my babies Marie). So, yes, I'd love to get this early. Thank you so much for offering this giveaway!! This giveaway is amazing! I love Marie Lu's writing and would love to have a book signed by her. Thank you so much for doing this! The end of the first one left me hanging! I need to know what happens next! Hello! I want to read this book because I really want to start reading The Young Elites, and I believe this would be the perfect motivation to go and but the series! I'm really interested in the story and, unfortunately, I still didn't have the chance to read Legend either. I would love having something by Lu. I want this book because I enjoyed the first book. Thanks for the giveaway! Marie Lu continues to amaze me with The Young Elites. The Legend series was one of my favorites too, but I am so excited for this one! I finished the first book in one day! Thank you so much for the giveaway!!! I love Marie Lu and The Young Elites so much!!!! I really love all of Marie Lu books (The Legend series, and The Young Elites) and I am really excited for The Rose Society! My favorite book I'm reading right now is the series: The Heroes of Olympus. Thank you soo much for doing this giveaway really hope I can win! I want this because I LOVED The Young Elites. Ever since finishing The Young Elites when it came out, I've been rolling around in dirt because of the ending. I cannot wait to get my hands on the sequel and this is an amazing opportunity to read the continuation to an amazing book. Marie Lu is one of my favorite authors!! Ever since I read The Young Elites, I instantly fell in love with concept of fighting between if she's evil and good. So I'm super excited for The Rose Society and I'm really hoping I can win! Thank you for this great opportunity! THE STORY IS SO AWESOME OMG. Huge fan of Marie Lu, cannot wait to see what she comes up with next!! The ending of TYE slayed me! I need to know what happens next! I cannot WAIT for this book! I read The Young Elites right when it came out, and have been kind of dying with the cliffhanger ever since! Thank you SO much for the chance! I seriously can't wait to read this book, I was dying when The Young Elites finished. Thank you so much for this giveaway, and thank you for making it international, most of the giveaways are usually limited to US only. I was like dying and crying when I finished The Young Elites at like 1 am. It's one of my favorite books and I wanted to read The Rose Society so badly. I'm dying to read this and I was so excited to find this giveaway! The Young Elites is a fantasy novel that captures me like a moth to a flame. This book is soo awesome that I was overwhelmed to the point of breathing histerically like a badger who just got rabies. Brittany, do ever get the feeling of wanting to go to the Grand Canyon alone and just scream? Pulling your hair with much frustration because the ending of The Young Elites hanged you on a cliff. Cliffhanger! (Haha! It's okay if you don't laugh :P) Well with certainity, I do feel that. And yes, even if it's been ten months ending the book with Adelina wanting to get her own way now has still affected me up until now. This fantastic fantasy novel fascinate me like a paleontologist who discovered a new type of Sauropod—the biggest dinosaur that had walked on Earth. I love this book so much to the point it became a sin; it really is, according to my religious teacher. How I longed to know if the nail-bite pressure is true that Enzo will come back—He will certainly will, even if I had to tweet Marie Lu thousands of times to both get her attention and bring back Enzo. The Young Elites is a remarkable novel that speaks out to all fantasy novel there is. It's one of the many fantasy novels I want to live in. And The Rose Society? It would be a dream come true to get my greedy hands on the Advance Reader's Copy. I just want to live in that fantasy again, my band-aid heart cannot take anymore of not knowing what happens—I am not the only one, hahaha, I know—it would be the bestest feeling I would get if I ever get picked in this kind of giveaway. Bless your heart, Brittany—for the hope. 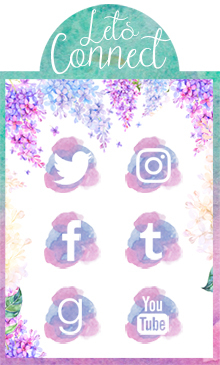 I don't have a GFC account (and for some reason, it won't let me make one...), but I followed via Bloglovin'. Is that okay? because i simply loved Young Elites! I REALLY want this book. Marie Lu is my favourite writer ever. She tweeted me on her birthday and I ws so happy because she THANKED her fans for the birthday wishes. She also favourited my tweet and she knows that I love her work. We're practically BFF's. Not really tho. I haven't read The Young Elites yet, because I have no money at the moment and the book isn't in the library yet. Even my parents know how much I love Marie Lu. I hope I can meet her one day, but I live in Belgium and I don't think she will ever come to Belgium... So if I could win the signed book that would be AMAZING!!! I completed all 11 entries I even made an account to have an extra entry!! I really want to win this giveaway. I want this book because I've heard such great things about Marie Lu and so I want to read The Young Elites series. Having The Rose Society would be a great way to push me to finally read it! Plus, the book is signed and that's pretty awesome! Thank you for the giveaway by the way! OOH MAN TYE was sooo cool. I just NEED TRS. And if I do get it, it'll be my first ever signed book! !